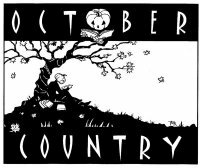 perhapablog... and other ramblings: super signing at OCTOBER COUNTRY COMICS this weekend in New Paltz!!! See the Spectacular GUEST LIST~!! super signing at OCTOBER COUNTRY COMICS this weekend in New Paltz!!! See the Spectacular GUEST LIST~!! EXTRA! EXTRA! EXTRA! EXTRA! EXTRA! EXTRA! EXTRA! EXTRA! Super Signing at The OCTOBER COUNTRY COMICS in New Paltz, NY, this weekend~! Great Comics! Great Bargains! Great Artists all Around! How could you NOT come~?!?! We'll be there from 1 to 4...will YOU?! Dang, that's at tempting line-up.